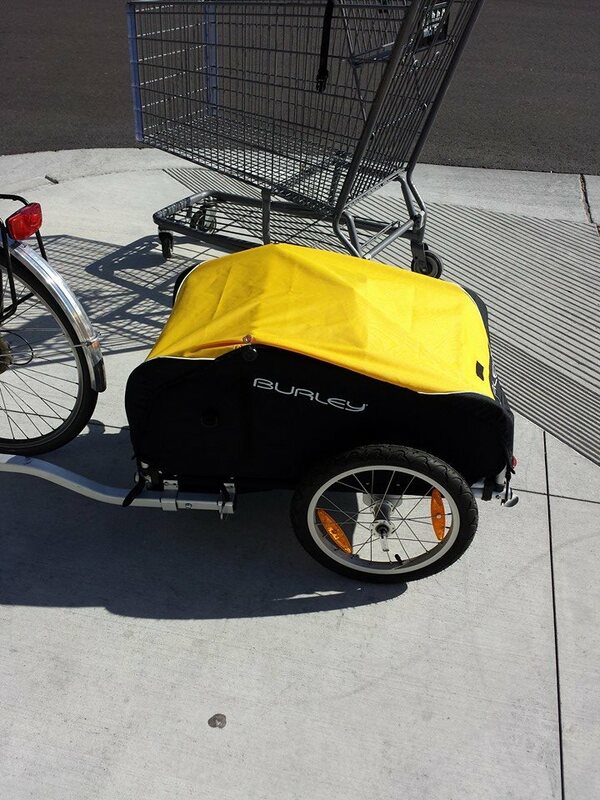 Fully loaded Burley Nomad bicycle cargo trailer. It all fit into the trailer! 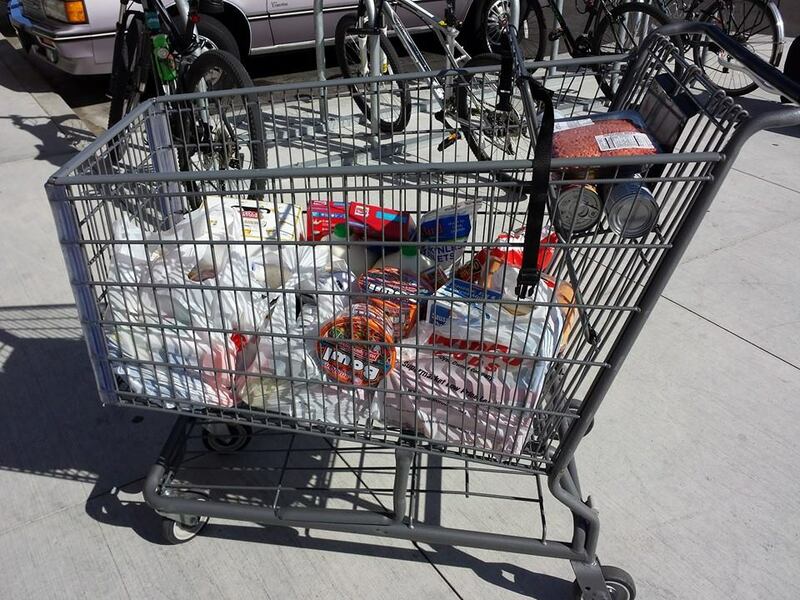 One of the most frequently-cited examples I've heard people give for needing a car is the ability to haul home groceries. I haven't starved to death just yet, so I thought I'd share my secret! As of this month, May 2014, I've been using a bicycle as my primary mode of transportation for eight years, getting by pretty well without a car. It's not for everybody, nor is it practical in all cases, but it works for me and saves me a lot of money. It also alleviates the fear of becoming sedentary, which is my natural state of being. My primary method of hauling home groceries is with two single compartment Ortlieb panniers, with a total capacity of 40 liters. These panniers can be left open at the top (when it's not raining) to carry a pretty impressive amount of cargo for a couple of bags on a bike. A single pannier can hold two gallons of milk, side by side, at the bottom, with plenty more space above. It can take some practice to pack these most efficiently, but it becomes routine after a while. Since I'm only buying groceries for myself, this makes the pannier-only option more practical than if I had an entire family to feed. I do probably have to make more trips this way than someone stocking up their car trunk for a month's worth of food, but it's well within the realm of feasibility, especially when pragmatically combining a commute and a grocery trip. For years I used to pass my preferred grocery store (among others) twice per day, five days a week. However, if I do feel like making one huge grocery trip, this is easily remedied with a simple cargo trailer. Even a child trailer will work. 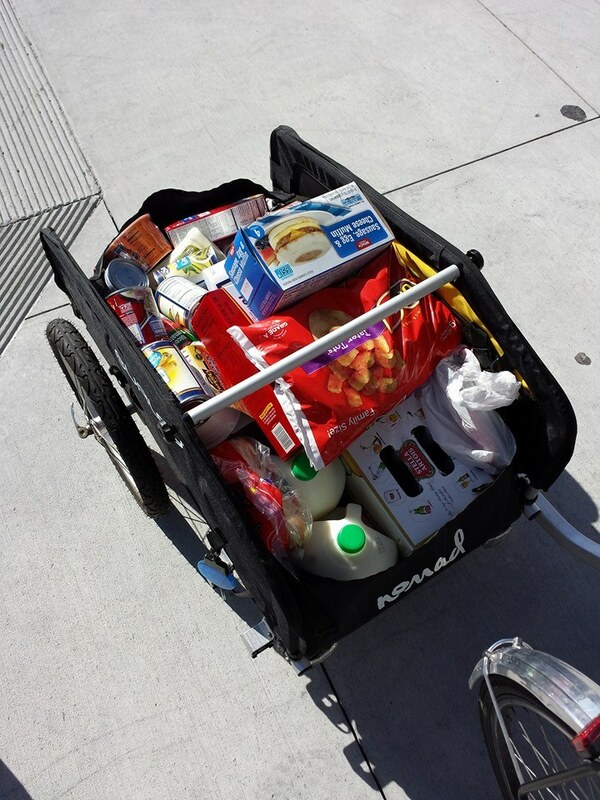 Pictured here is a fairly heavy (from the groceries), well-loaded Burley Nomad, which I've also used to bring home things like office chairs and LCD monitors. It's actually one of the smaller cargo trailers available, but it works pretty well. Loading the trailer up this much is mostly a proof of concept, because I generally never feel the need to buy this much food at once, and I like the convenience of panniers. Unlike a trailer, you tend to always have them with you, which is convenient if you decide to pick something up on the way home. 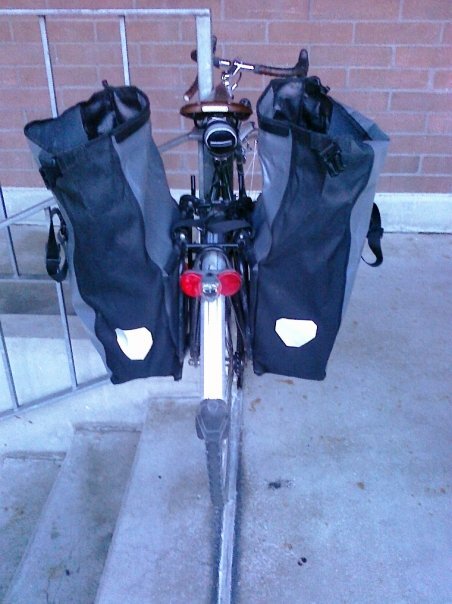 If there are two cyclists in your household, you might consider both riding to the store with a set of panniers each. If bulk-style grocery shopping fits you more, however, I encourage you to try hauling home some stuff in a child or cargo trailer. The distance from me to the grocery store I prefer most has typically been about 2-3 miles, which makes it 4-6 miles round-trip. I'm fortunate enough to live near a less-preferred grocery store if I need something in a pinch and don't want to make the trip, but for a year I'd make weekly trips pretty regularly, even through the winter. I almost sometimes wish the other store weren't so close, because the prices and selection aren't nearly as good, and the temptation is great. It does save a bit on stress through the winter months, however, because there's always the option of using a messenger bag and my sneakers when the road conditions are really bad. In short, I think bicycles are a lot more practical than people give them credit for!